Although online poker is in essence the same game following the same rules you may play at home or in a casino, there are vast difference in terms of the strategy you should employ if you want to end your session in profit. There are certain areas where there is a vast advantage to playing online, some factors however can feel a hindrance at first. For instance you will not be able to pick up any visual “tells” from your opponents, tells you may have relied on to make money in your home games. Once you settle into this type of play however you will find other ways to pick up information on the strength of your opponents hand, which could in turn improve your home play! The first thing to take note of is how fast a player makes or calls a bet. A fast bet is often the sign of a weak or drawing hand, while a more thoughtful bet can indicate the player has a bigger hand and is deciding how to best maximize the opportunity. 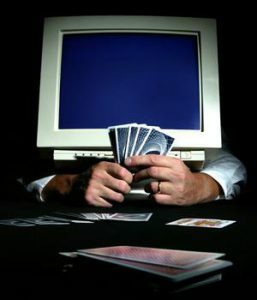 If a player is using the “auto play” check boxes (which are used to predetermine your bet before your turn to act) information can be gathered here, if a player auto checks you can assume he doesn’t have much interest in the hand, if a player is set to “raise any” you can assume he is fairly confident on the strength of his hand. Another useful tip is keeping an eye on the chat box can also help you understand players emotional states and spot players who are “on tilt”. Looking at the many pro’s to playing online the obvious main advantage is the massive range of tables you have to choose from, a smart player will be selective about which table he sits at. Often players will join the table with the largest “average pot” as they feel the action on this table will mean they can make profit quickly, this often however isnt the case as larger pots often mean more players seeing through to the river and the money going to the best hand rather than the player with the most skill. Look out for tables with pots around 8-10 times the big blind, then hopefully you will also find a good mix of tight and loose players so you can mix up your playing style. Whether you take the time to carefully select a good looking game or if you just jump in straight away one thing you will benefit from with online poker is a much higher level of hands per hour than in a live casinothere you might hope to play 20 hands per hour, but online with automatic shuffling dealing and allocating pots to the correct players you can expect to play around triple that. This greatly enhances the ability of a solid player to make money.